I was live-streaming the men’s long program for the Cup of Russia but the stream was really choppy by the time they got to the last 4 men. My stream was literally 2 seconds of figure skating, 10 second pause, skip, another 2 seconds of figure skating and… another pause. I had pretty much given up on watching and just ran the rest of the stream anyways just to see to the end. The video was so choppy that I had no clue that Jeremy Abbott was a headcase in his long because all I could see was the flow from the occasional transition movement that the stream decided to show me. Jeremy’s program is rather interesting and intricate – though it looks too busy at some parts – and it was luckily awarded the PCS it deserved. This is a difficult program and I hope Jeremy can do it justice. I’m sure it would look a lot better without two big falls and a lack of concentration in the second half. Javier Fernandez won the long program, though he did lose to Yuzuru… by 0.03. Wow. This guy is poised to win Euros this season though and I’m very excited for him. As for Yuzuru, despite the two falls, this guy retains his lovely flow and all the elements look as if they’re joined seamlessly with each other. I’m really hoping that he’ll kick Oda off the Japanese National podium this year. He’s too talented to not make his mark at Worlds though right now, experience is what he really needs. He has youth on his side and even if he doesn’t make it to Sochi, I’m sure the Koreans would love his anime-esque face at Pyeongchang. As for my predictions, I’ve learned not to underestimate this guy. I’m sorry I doubted you, Yuzuru. Overall standings for the men’s event at the Rostelecom Cup here. I’ll post the list of people going to the final very soon. I just put a random team in the bronze position for my predictions because I really had no clue who these C-list teams were. The Russian team I put in bronze did come in fifth place but this team really took me by surprise. And in a pleasant way. Berton and Hotarek have yet to get all the technical elements to compete with the top teams in the world but there’s a real connection between the two of them and they’re quite lovely to watch. Stefania has lovely lines and they have a flow that some teams would die for. I’m very happy for their bronze and I hope they improve in time. Something has changed with these two. Or should I say, Yuko seems to have improved by leaps and bounds. Her knees are a lot softer now and she looks less like a possessed psychopathic ball-jointed voodoo doll. I’m really glad they kept this program and that they’ve improved it because I really wanted to download it onto my computer for offline viewing but I couldn’t find a version I liked because of how it was skated. I was always too creeped out by Yuko’s floppy dead voodoo doll look throughout the program, especially in the ending pose. I dunno if they can beat Tanya and Max (my instinct says no) but I’m glad that they’re doing this program justice because it’s a lovely piece of work. I was rather impressed by the team’s new found flow and softness. I don’t know what Tamara Moskovina did, but I have nothing but respect for her right now. Pina is a very interesting program. Aliona and Robin mentioned that it was one program that you either love or hate and I think I’m leaning towards the former. It’s creative and although it’s a bit of a work in progress, I’m having a lot of fun watching it. It’s quirky, interesting and unexpected and I think that’s what really pulls me towards it. Aliona and Robin didn’t skate this perfectly (Aliona stepped out of her 2A and put her hand down) but I have faith in these two and I know that this program will be uber awesome at future competitions. 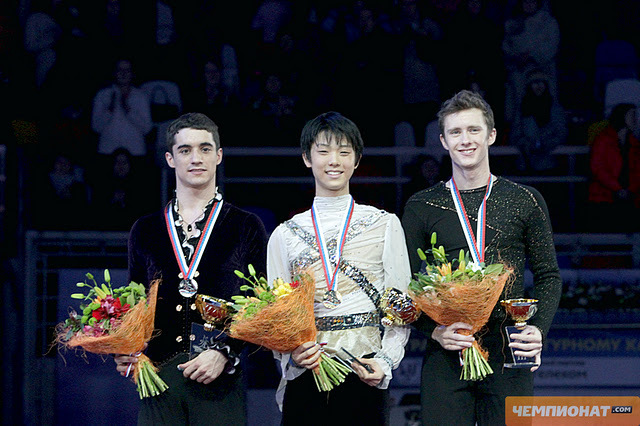 I’m very happy that they’ve redeemed themselves from that bronze medal at NHK. Good work, guys! What did you think of the pairs competition at CoR? These two performances made the competition for me. It’s great to see the new and improved Mao-chan~! Which were your favourite performances at NHK? I slept in today because I’ve been so sleep deprived all week and then I realized that I missed the men’s LP! =( I did watch the gala though but my internet connection wasn’t good enough to watch Daisuke’s performance. Darn. 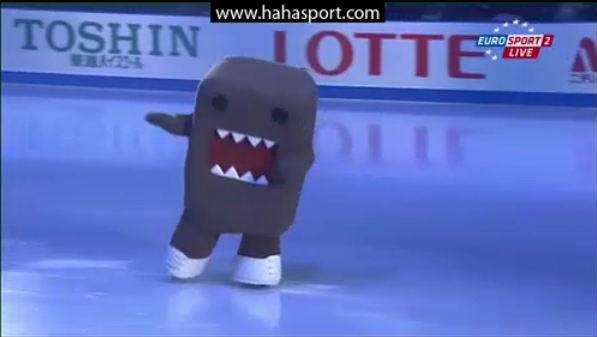 At least I got to see a skating Domo-kun. This is definitely an improvement from Skate Canada but still a work in progress. Daisuke needs to have more flow and commit to this program just as much as he commits to his SP. If he does that, he’ll be mesmerizing. He’ll also need to work on his quad too if he wants to be competitive with Chan. Other than that, this is a pretty good performance at this point in the season. Let’s hope he can muster some great skates at the final – I’m pretty sure he’s done enough to get there. Results for the free skate. In other news, Tomas Verner seems to have completely bombed this competition while Michal Brezina did very well at the Cup of China. Will there be a new Czech national champion this year? Now, I’m waiting for a video of Daisuke’s exhibition to pop up because I love that program. What did you think of the men’s podium?